The first days of homeschooling feel empty. I remember feeling like a failure when my daughter went through our daily curriculum in less than 2 hours. 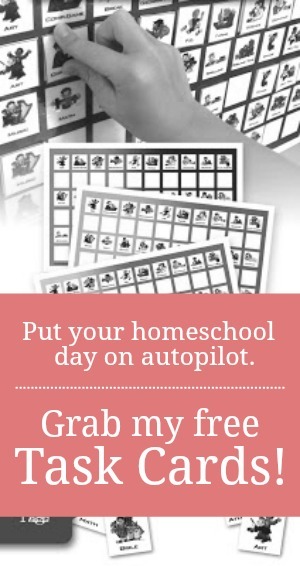 I often said, “That can’t be all.” Most homeschoolers will tell you that those early elementary years have very short days, but once they get to the upper grades, they will spend more of the day on schoolwork. We ended up filling our days by taking walks, playing outside, reading lots of stories, and having tea parties. We followed our curiosities and worked on projects that sounded fun. However, like any vacuum, activities and responsibilities soon filled up our days to overflowing. Eventually, I found myself saying, “Yes, but when will we do school? We have to fit math in here somewhere.” Right now, that same 1st grader from when we started homeschooling is in 7th grade and not only does she volunteer at the library, she is in a sport, plays 2 instruments, is part of a challenging co-op, and does church youth activities. Our days are full to the brim. She’s not my only child either. If we're not careful, our desire to let the kids deepen their interests and our plan to respect their individual gifts can become an overwhelming assault on our family’s downtime. Our lazy days get robbed, our moments curled up with a book just for fun, and evenings playing a family game can become a far-off dream. 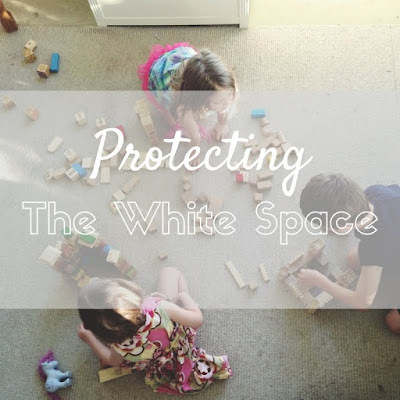 The longer I teach, the more I see a need for white space in my kids’ lives. It’s necessary not only for our sanity, but in order to enable depth in their comprehension. When we just rush through the day, checking subjects off a list, my kids’ learning is like a rock skipped across the surface of a lake. The information never sinks deep. Philosopher, Josef Pieper explains that the word “Leisure” comes from the same root word as “school.” Leisure time is time for us to reflect on things that we know, and let all those facts process. It’s for staring out windows, making observations, and wondering why the grass is green. “Amusement” on the other hand, comes from the root word “muse” (to think), with the prefix “a-“ (not). In other words, amusement is absence of thinking. He would argue that leisure time isn’t a luxury of an education, but it is the foundation of an education. Block out the time for all your subjects in your daily school schedule. I have cut several subjects over the years. I have done the math and it actually isn’t possible to study all the curriculum I bring home from a homeschooling conference. So, cutting keeps the daily goals realistic. Some years, we do science in the summer. Maybe spelling can be done in certain months, or grammar cane be always be tackled on Mondays. Consider taking fewer subjects at a time rather than doing bits of several subjects every day. Loop scheduling can work for house work and morning time too. Decide how many evenings of white space your family needs. I prefer to have two evenings blank. Since we have a large family, our home has extra chaos and noise. So, we need extra rest time. My husband is an extrovert and loves taking the kids places, and I’m the introvert, and prefer to stay home whenever possible. So two blank evenings is my ideal, and one evening a week is my non-negotiable need. If necessary, write it in on the calendar, so other family members know that there will be a FIRM planned rest, and that it’s actually not a vacuum that needs to be filled. Establish a daily family rest time. Like the Spanish siesta, our family has an hour of quiet time during the little kids’ naps. The older ones have learned to let their brains wander, pick up their favorite book, practice the guitar without interruption, and have a time in their day when they don't have to tell the younger ones to NOT touch their stuff. When we first started rest time, I gave each of my older kids a $15 budget to decorate their own “sanctuary space” in our house. These "sanctuaries" have become places they can call all their own. While rest time has really cut into our school time, it has reaped multiple rewards in my kids’ attitudes and work ethic for the rest of the day. Ironically, we get more done when we have the rest. It turns tempers from ragged to rested. Don’t make plans for your ideal life. Make plans for real life. Plan for toddler meltdowns and late night talks with your teenager. Handling those things well is more important than knowing Latin. Over-scheduling will only make you snap at your kids more, and sets an attitude of hurry and rush to the home. There needs to be space in the day for them to talk about life without feeling swept along. When you don’t plan for rest, you are planning for fights, stress, and frustration. 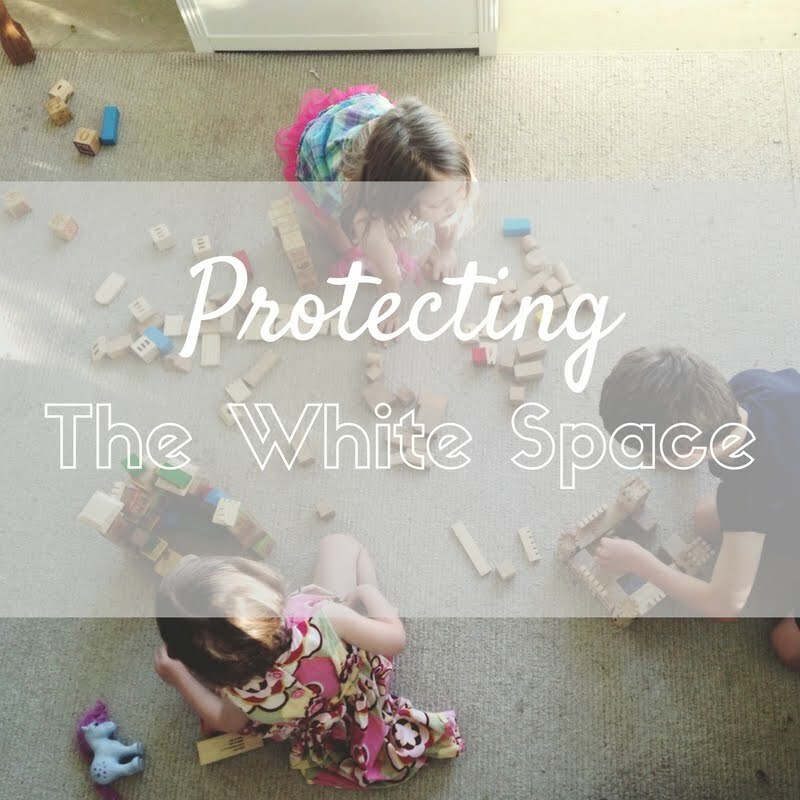 It’s important that you give white space in your homeschool at least as much priority as math or reading. Without it, all the other subjects fall short. It's so easy to over schedule the family. Thank you for your words and tips! What game is being played? The board game in the picture is called Survive. Thank you, oh, so much, Gretchen! I used to think there was something wrong with me...why couldn't I just get a grip and let my kids do all the things their friends were into. To be fair, my kids have never begged to do these things, but I had mommy guilt about it nonetheless. I have realized over time that there is a precariousness to my spirit when "busy and rushed" are the words of the day. I become the little green hulk from your kids' game!!! Thus, we live very uncluttered lives at a moderately slow pace. And we all seem to thrive. I really appreciate hearing from other moms who have found it nourishing as well! Here's to more togetherness and less rat race! P.s. Also, I love that you have tea time! We are extremely fond of tea Around here too! P.p.s. I believe we live in the same bit of frozen tundra....only we are farther west from you! Nice to meetcha neighbor! What a very full perspective you must have this time around, Diane. I can only imagine how differently we all would do it if we had a TAKE TWO. How exciting!